During the party which was DJed by DJ Xclusive, the housemates were seen exchanging pleasantries with the Disc Jockey, however, he was excited to see Lolu and even called his name without looking at his name tag. 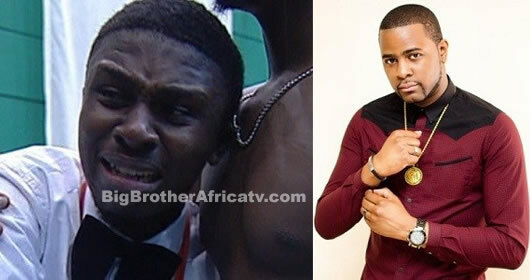 After the party came to a close, Lolu broke down in tears and as his colleagues tried to comfort him, he revealed he was weeping because DJ Xclusive remembered him and even knew his name. He also revealed that he was the first OAP to play Xclusive’s song ‘Jeje’ which featured Wizkid. He said he is emotional because at that time he was promoting Xclusive’s song on Beat FM Ibadan,,he had only N20 to his name. He later said he is one of the people responsible for Xclusive’s success as he promoted the song before anyone and now it’s amazing Xclusive remembers him.